You sure did spend a lot of time and space copying stuff. What I don't see is any real evidence that churches are actively engaged in 'heresy' based on semipelagianism. You say it a lot, but I see no evidence. You opine that "The church in the United States has been ooozing with the heresy known as Semipelagianism since the time of Finney and the frontier revivalists." You mention (in an incendairy and insulting way) that because churches open their arms and welcome visitors and because they go out of their way to help them feel comfortable, that they are guilty of this "semipelagianism". MOST PEOPLE are not theologians. MOST PEOPLE aren't interested in understanding the nuances of the philosophy of religion or in studying the various politics surrounding the early church from crucifixion through the 14th or 15th centuries. You attempt to promote yourself as an academecian or a 'learned theologian', but all you are doing is confusing people. I read through this and tried to see it from an average "joe the plumber" perspective and I say - but God has granted me free will, and in that free will I choose to follow Jesus. You are telling me that I am not "capable of making a free will decision to love and follow God" and to believe so is heresy. The nuance that Grace, given by God, has paved the way for me to have this "free will" isn't apparent, and is probably just a bit more convoluted and complicated than the average person would care to spend the time trying to grasp. Again, semantics comes into play. You use words to obfuscate the very simple message of the Gospel which is that Christ died on the cross for our sins and through His sacrifice we are saved. Make it so complicated that only the very studied and elite can understand it and you take away so much of what Christ taught. Christ taught in parables because parables were easily understood - stop trying to 'EDIFY' and start just teaching, leading, talking and conversing with people. 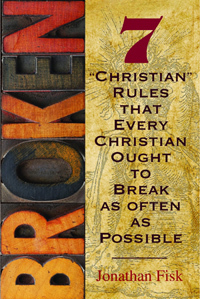 I fell into the trap of believing I could never follow all the rules of Christianity and neither was I interested in learning all the gobbledy gook & catechistic language that 'good christians' were supposed to learn. As a result, I turned away from God for 30 years, or more. When I finally understood that I am saved by Grace and that God loves me and I am accepted by Him as a good and faithful servant whether I can pronounce semipelagianism or not - then I understood what being a Christian was about. Only then did I believe that I could 'measure up'. Only then did I embrace my love of Christ and began to let Him change my life. You make it hard, you make it scary (by crying HERESY all the time), you make it so very intense and confusing that I fear people will turn away rather than open themselves to the possibility that they are God's beloved creation and are offered the gift of salvation by Jesus. It makes for fiery rhetoric, but bad theology. This post brings two things to mind. First, there is a feeling of hopelessness—that the church is still screwing up stuff the same way we always have. Second, there is a feeling of hope—that we have already seen the twisting of Scripture and the catering to man's ears come and go. All in all... I love that you posted these canons. Reading the historical accounts of the church defending itself against heresy shows me that those of us who stand vigilant, trying our best and by whatever means reasonable to protect the message of the Gospel are not alone; we stand in the company of many intelligent people before us who have studied the Scripture (probably moreso than all of us) and who have come to similar if not identical conclusions in its defense. @Shirley - The reason these canons were written is because of the consequence of relinquishing the intellectual part of theology. Without studying and understanding Scripture—without coming into a better understanding and knowledge of Christ from the very book He provided—we are in danger of reverting to messages that omit or obfuscate the Gospel, not the other way around! If we don't ensure that people understand the nuances of theology, they will be swayed in believing things like mysticism, gnosticism, and the like. Things that "sound spiritual". Without the discernment of an understanding of Scripture, Joe the Plumber will not know how to determine if something that "sounds spiritual" is actually Scriptural. The degrees may only be a bit off at the *beginning* of the journey, but by the *end*, who knows what he'll believe?! The beauty of canons, creeds, catechisms and hymns is that they DO try to condense the essentials of theology into something digestible. With them, people are more inclined to have answers to questions like, "So why do you believe in the Trinity?" Instead, nowadays, most people say something like, "Oh, I don't get into all of that. I just love Jesus." That sort of argument sounds good until someone says, "Well, then you can agree with me that there is only one God who manifests Himself in different modes, right?" And then they start listing verses from Scripture. Now Joe doesn't have an argument, and can be swayed into modalism, then maybe into the belief that if he wasn't "baptized in the name of Jesus—the onlyoOne true God" that he's not saved (this is a common belief held by Oneness Pentecostals). Joe's very SALVATION is now in question, and he has no information with which to respond. And this, of course, is one of hundreds of examples throughout history. I vote for more intelligent theology to be taught in more churches every Sunday and more (classes available throughout the week or in Sunday School, etc.). People need to know more about their faiths to be less susceptible to false doctrine. What happened to you was monsterous and my heart goes out to you. People did not present the gospel of Christ to you and that is a terrible tragedy. You were a victim of the very thing that Chris and others are trying to stop. Your previous bad experience with Christians who taught you a legalistic list of "does" and "don'ts" instead of the clear love of Christ is happening all over the place. One of the reasons why this happens is because common folk innocently trust people to teach about God, but those people know next to nothing about their professional field: Christian Teaching. Because of this, they mislead people... lots of people. The reason why Semi-pelagianism is so important is because church leaders who believe this teaching often push "making a decision for Jesus" on people to the point where they can only see THE CHOICE THAT THEY HAVE TO MAKE ALL ALONE BY THEMSELVES instead of seeing the love of Christ. This teaching of free will gets in the way of Christ and his love for us and puts the burden on you and your choice to follow God. Many teachers use this false teaching to guilt people into becoming Christians through emotional manipuation and half-truths about what the Bible actually says. What's worse is that when people start to worry about their salvation and worry that God does not love them, instead of pointing them to Christ and His love, these teachers point people to their own decision and will to follow Jesus... which is the very thing that they are having doubts about. They turn your faith into trust about the decision you made rather than faith in Jesus' work to save people on the cross. I hope that you can see that, while this may seem complicated, it is vitally important. You want your preachers and teachers to know this stuff for the same reason you want your politicians, judges, and police to understand the Constitution and the Bill of Rights. It's a bunch of words on a page that can be confusing, but it protects everyone's rights. When leaders ignore the complex issues and teachings of the Bible, they can easily trample on the consciences of the Christians that they are supposed to care for. You have a right to receive the truth of Scripture from compitent preachers that you can trust. That only happens when they fully understand the Scriptures that they are supposed to study in great detail. That is what Chris is trying to get people to see... that the complex issues of church doctrine directly effect the folks sitting in the pews.